Search for water well and spring data by county, quadrangle, AKGWA number, or radius around a point of interest. Returned data includes information about location, useage, construction, and when available, the lithology and casing data for a well. You can also download the well and spring locations and the lithology and casing data. Map links are also given for plotting on the groundwater map service. Use this map service to view water well and spring locations and their associated data. This map service can also be accessed through the water well and spring records search above (click on the map link to view the well on this map service). Search for groundwater-quality data by county, quadrangle, AKGWA number, or radius around a point of interest. You can view and download data for 545 different analytes from 15 analyte groups: bulk water properties, caffeine & derivatives, herbicides, inorganics, metals, microbes, nutrients, PCB's, pesticides, petroleum hydrocarbons, radionuclides, residues, SVOC's, VOC's, and other analytes. Data can be downloaded and a link to the groundwater quality map is provided for each location. Plot groundwater-quality data by Physiographic Province or HUC 6 Watershed basin for 38 possible analytes. You can choose to display the data in a cumulative, analytical value vs. well depth, or box-and-whisker plot. 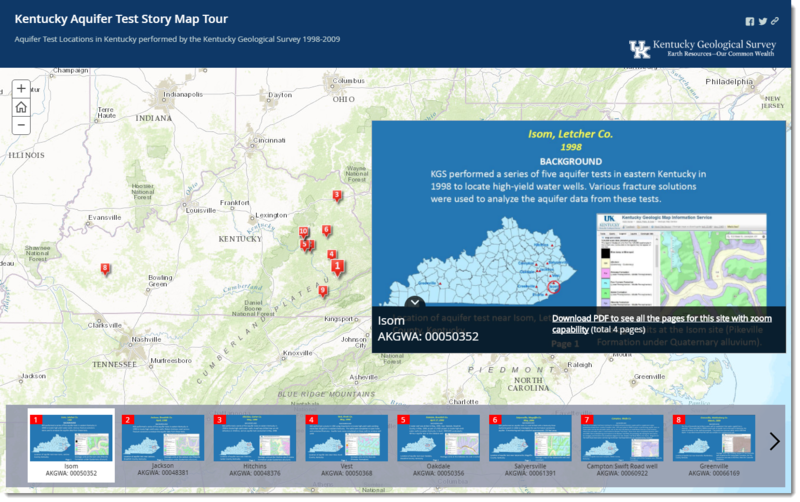 Use this map service to create a thematic map with the same water quality data (545 different analytes from 15 analyte groups) that is found in the groundwater-quality data search above. Select one analyte from a category and view the analysis results as symbols across the state or an area of interest. Analysis data for each site can also be viewed, and a link back to the data search is provided for data download capability. A derivative map available on the Geologic Map Information Service, which displays the potential for karst development based on the mapped 1:500,000 and 1:24,000 geologic units. Mapped sinkholes are also displayed, and water wells and springs can be shown. This web service is hosted by KGS in partnership with Watershed Watch in Kentucky. 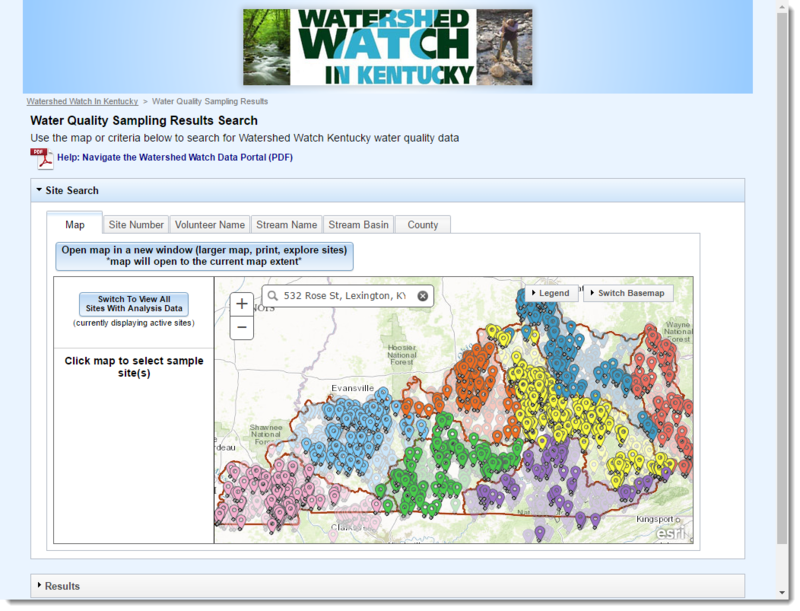 The database provides historical water quality sampling results from the Watershed Watch programs in each of the eight major basins in Kentucky. Users can search for and view sampling data, and find data via the map interface. 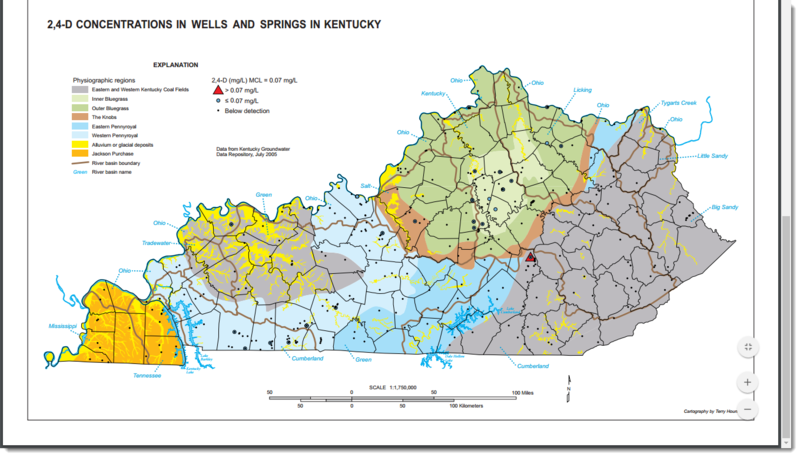 Photographs, charts, and graphs for various aquifer tests across Kentucky. 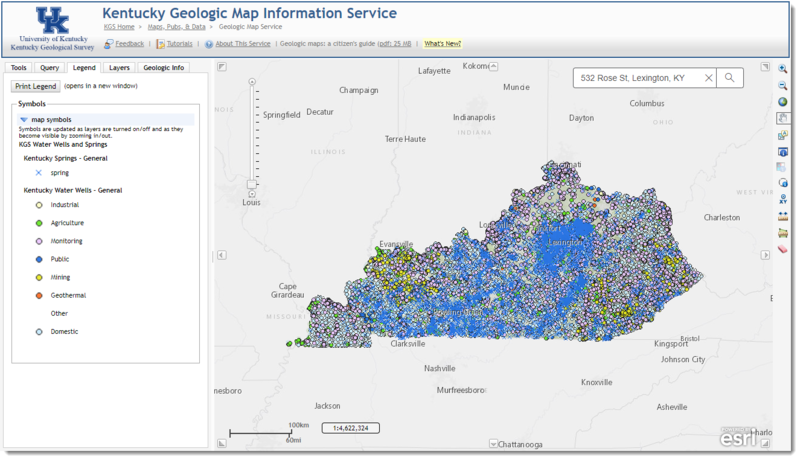 Maps displaying a range-of-value data for over 50 parameters of groundwater quality from samples taken across Kentucky.